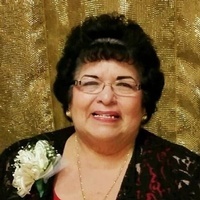 Rachel A. Jablonski, 78, of Oppenheim, New York passed away on Monday, March 4, 2019 at Little Falls Hospital with her loving family by her side, following several months of health complications. She was born on February 10, 1941 in East St. Louis, Illinois and was the daughter of the late, Fernando and Rose Mary (Salazar) Sanchez. Rachel attended Holy Rosary School, Fairmont City, Illinois, and East Side High School in East St. Louis, Illinois. On November 27, 1965, Rachel was united in holy matrimony to Joseph S. Jablonski at St. Stephen's Catholic Church in Caseyville, IL. The couple has shared 53 years together in which they raised their three children in a loving home. Before moving to the Town of Oppenheim in 1973, Rachel worked for her family's restaurant called The Club Durango in Collinsville, IL where she was a waitress, cook, and her mother's right hand in the daily operations of running the family business. She would even entertain; often singing with the local musician. At one time, she also worked for International Shoe in St. Louis, MO. Rachel and her family relocated to the Town of Oppenheim, NY after purchasing a dairy farm; Jablonski Family Dairy located on County Highway 108 in Inghams Mills. She cared for and nurtured four generations of family on the farm with her loving hands and her candid and vivacious sense of humor. She owned and operated the farm with her husband, Joe for 32 years until their retirement in 2005. She was a devout Catholic and was a parishioner of St. Joseph's Church in Dolgeville, New York. Rachel enjoyed cooking and baking all homemade food. She mastered the art of all of her family's Mexican and Polish dishes. She enjoyed all types of music, shopping, and jewelry. Her most precious time was that spent in the comfort of her loving family. Rachel is survived by her beloved husband, Joseph S. Jablonski; her loving children, Carolyn Marie Chavez, and her companion, Ken Plummer, Stephen J. Jablonski and his wife, Wendy of Oppenheim, NY, and Father Michael J. Jablonski of Malone, NY; five beloved grandchildren, Marcelino D. Chavez and his fiance, Alexis Powell of Dolgeville, NY, Celina V. Chavez of Dolgeville, NY, Marisa E. Chavez of Gloversville, NY, Stephen J. Jablonski, Jr. and Jennifer L. Jablonski of Oppenheim, NY; one cherished great-grandson, Marcelino D. Chavez, IV; two sisters, Guadalupe Sanchez-Thompson of Dale City, VA and Elizabeth Sanchez Setzer of Fairview, Heights, IL; brothers and sisters in law; Stanley F. Jablonski and his wife, Kathleen of Johnstown, NY, Donna Jablonski of Fort Johnson, NY, Karen Quist and her husband, Harry Quist III of Fort Johnson, NY; many nieces, nephews; special family friends, George and Pauline Souza, the Carona family, Micheline Becker, and Lydia Ponte. She was predeceased by three brothers-in-law, Clarence Thompson, Norman Setzer and Thomas J. Jablonski. Calling hours will be held on Thursday, March 7, 2019 from 4 p.m. to 7 p.m. at Miller-Plonka Funeral Home, 30 Wolf Street, Dolgeville, New York. A Mass of Catholic Burial will be celebrated on Friday, March 8, 2019 at 11 a.m. at St. Joseph's Catholic Church, 30 North Helmer Avenue, Dolgeville, New York. The Mass will be officiated by Rachel's son, Father Michael J. Jablonski and Deacon Jim Bower. Interment will be held at a graveside service in the spring in Rural Park Cemetery, Ingham's Mills, New York. Please consider memorial contributions for St. Joseph's Church, 31 N. Helmer Dolgeville, New York 13329. To leave a message of sympathy for the Jablonski Family, please visit www.millerplonkafuneralhome.com and sign the guest book.